Police in Zimbabwe say they have arrested nearly 60 supporters of the opposition MDC, as the country awaits run-off presidential elections. 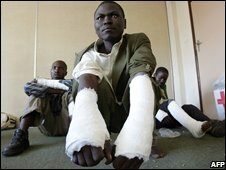 The activists were held on Thursday on suspicion of torching homes of members of the governing Zanu-PF in Shamva, north-east of Harare, the police said. The MDC often accuses the authorities of intimidating its supporters. 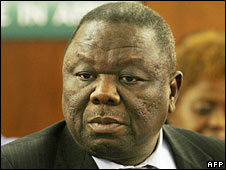 News of the arrests comes amid expectation of the return of MDC leader Morgan Tsvangirai for the campaign. Mr Tsvangirai has been in South Africa since the first round because of alleged threats to his life. Justice Minister Patrick Chinamasa said the opposition leader was free to return but did not rule out the possibility of his arrest. Mr Tsvangirai said he would offer Mr Mugabe status of "father of the nation"
He said Mr Tsvangirai could have committed crimes which law enforcement agencies would deal with. The minister said Zanu-PF would not allow an opposition victory, as this would be what he described as tantamount to slavery. Asked whether the will of the people would be subverted should Mr Mugabe lose, Mr Chinamasa said: "If people attempted to unfree themselves, moves would be made to free them." The BBC's Will Ross in Johannesburg, South Africa, says the latest comments from the minister are further signs that the ruling elite is determined to cling onto power. Official first-round results put Mr Tsvangirai ahead of President Robert Mugabe, but not by enough votes to win outright. Mr Tsvangirai said the run-off should take place by 23 May - within three weeks of the first-round results being declared. But the chairman of the electoral commission said this was not possible. George Chiweshe told the Associated Press news agency the commission needed more time to prepare for the vote, and had not yet been allocated funds by the government. Police announced 58 arrests in Shamva on state TV, saying seven people had been injured in the violence, and four houses and a tractor had been burnt. An opposition lawyer said earlier 56 of its activists were in police custody. The MDC has frequently complained of intimidation, saying at least 25 of its supporters have been killed since the first round and hundreds have been forced from their homes in rural areas. But police and officials from Mr Mugabe's Zanu-PF party have accused the MDC of staging attacks, saying it has exaggerated the scale of the violence. Mr Tsvangirai has demanded "unfettered access of all international observers" and journalists covering the vote and called for southern African peacekeepers to curtail any violence. But in an apparent softening of his stance towards Mr Mugabe, he said the veteran leader would be given the status of "father of the nation" if his 28-year rule ended. Mr Tsvangirai said he gave the assurances at a meeting with Angolan President Jose Eduardo dos Santos, a close ally of Mr Mugabe. Last month, Mr Tsvangirai said his rival should be put on trial for alleged war crimes. According to official declarations, the opposition leader won 47.9% of the vote, against 43.2% for Mr Mugabe. Although the first round was largely peaceful, the results were not announced until 2 May. The MDC says the delay gave the authorities time to rig the counting and carry out attacks on its supporters in anticipation of a run-off.